Here we are - at the finish line. 40 days. I did it! I know, I know - you're all soooo proud of me aren't you? Well, I don't know who has really been following this (except Jen - so loyal and devoted! Thanks Jen) but for all you naysayers out there I just want to tell you that IT CAN BE DONE. And it's not as difficult as you might think. Here's a little recap of the challenge, a post on today and my plan for what is to come. Today I was invited out with Pat to do some fishing (surprise - huh? More fishing). Well, it's always a pleasure to go out with Pat on his boat. He's a great host and a great guy all around. His boat is amazing and it gets us out into the ocean in a fraction of the time it usually takes me. I just wish that he didn't bring along the bag full of mini chocolate covered donuts! Thanks Pat! I still remember the chocolate covered strawberries a few weeks ago. This fish was 37 inches long. Very nice specimen indeed. Initially I though that the size of this one topped the two that I caught on the beach the other day but my fish measured 42 inches. I still think that there is a 40 pound plus striper out there just waiting for me. It's going to be on my spear though - not my fishing pole. Maybe next week sometime if the weather is nice. Ok - so Day 40. This is the final day of the SDC and for meals I had rice, bass jerky, and a lot of crabs. With the crabs, I couldn't have asked for a better final two days worth of meals. I enjoyed them better than anything that I could have bought or ordered in a restaurant. The final two days were not much of a challenge at all - they were a treat. My beans, rice and butter rations held out well. I still have close to a stick of butter left and you can see how much beans and rice I have. Admittedly, I got a little tired of cooking and eating beans and rice (especially beans). 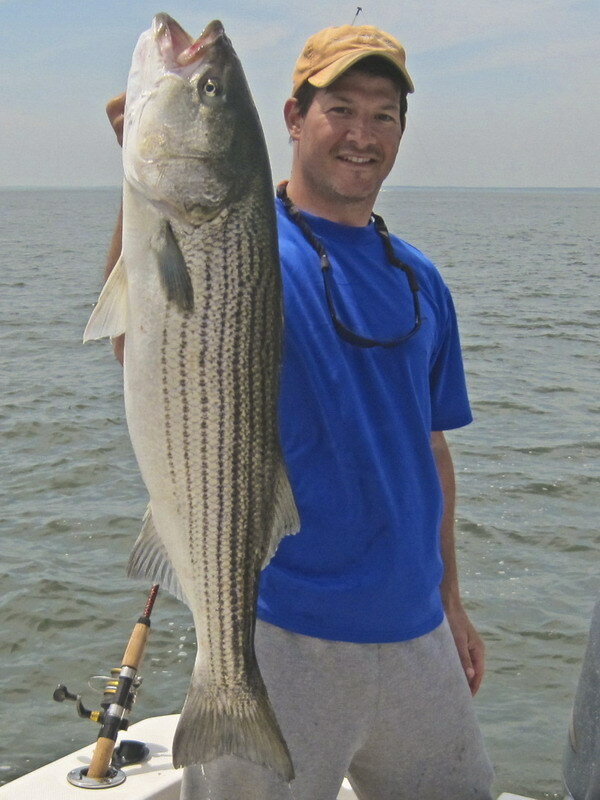 I think the main difference between SDC1 and SDC2 was the fact the the striped bass came in and were so plentiful. I went back and read some early posts and forgot how difficult it was for me and Ty to catch fish in the beginning. I can't believe that I was eating those little crappy sunfish from the pond down the road. Makes me feel better that Mr Fredrickson was released back into the wild. The question on everyone's mind. . . where do we go from here? Well, you may be excited to know that I am going to continue my blogging. I can't just end here because I need to document what happens afterward. Am I going to pig out tomorrow? Am I going to start that exercise routine to get my 6-pack abs? Am I going to try to eat seasonally? How much weight is coming back on and how quickly? Will I ever get a shot to be on the TV Survivor??? Ha! Maybe someday. Jeff Probst, if you're reading - Come on man, give me a chance! My initial plan is to eat seasonally, have a "reward" indulgence meal or special treat once per week, and spend 2 weeks on the P90 Ab Ripper X. I may overindulge tomorrow as a celebration but after that I'm not going to go too crazy. There are some chocolate covered marshmallows on graham crackers still around (I can smell them) and I think one has just been invited to breakfast. Ha. Thanks for reading everyone (or just Jen if you're the only one). Check back occasionally to see updates and my A.D. (After Diet) posts. If anyone was inspired by my adventure/misadventures and would like to join me for SDC3 in the future, I would love to have some company. "Sometimes you have to jump off the cliff and make your wings on the way down." and, the one that I have been waiting to use for this particular moment. . .
"A great pleasure in life is doing what people say you cannot do."